SAN DIEGO – After weeks of anticipation, the West Squad reigned supreme in the 2018 Perfect Game All-American Classic with a 4-2 victory over the East on Sunday night. In what was a game dominated by power arms on the mound, the deep pitching staff of the West Squad was able to stifle hitters in route to a third straight victory at the event. The high level of competition made for an exciting game from pitch No. 1 on Sunday night, and the East Squad was able to strike first before their starter Daniel Espino even had to take the mound. After CJ Abrams opened play with a walk, Riley Greene was able to drive a ball deep to the left-center field gap of Petco Park to take a 1-0 lead. After the exciting first half inning of play, Corbin Carroll decided to get things started for the West Squad with some fireworks of his own. Carroll was able to drive a 98 mph Daniel Espino fastball deep over the head of center fielder Jerrion Ealy, and he would cruise into third for a leadoff triple. Carroll would hustle in to score after getting a great jump on a wild pitch, and that effort all night was good enough to take home MVP honors. Carroll, who is a native of Lakeside, Washington, will be attending UCLA to play his college baseball. The future Bruin had a great time at all of the different events at the All-American Classic, and was very appreciative of the life changing experience. Carroll finished Sunday ‘s game 1-for-1 with a triple, two runs scored, two walks, and an RBI. This impressive performance follows up what was an equally as impressive run at the 17u WWBA National Championship in early July. Runs came at a premium on Sunday night, and it was due in large part to every pitcher featuring a fastball of 92 mph or better again this year. Overall, the game featured 18 strikeouts, and many of the power arms that were slated to throw were just as good as advertised. One of the more impressive pitching stretches in the game came in the middle innings. After the West squad was able to get a run back to tie the game at two in the bottom of the fourth, Cypress, Texas righthander JJ Goss was able to pound the strike zone in route to a 1-2-3 inning. Goss worked up to 94 with a good fastball, and his loose arm action was very impressive. After Goss’ appearance, East squad righty Matthew Allan put together one of the best innings you can hope for on the mound. Allan worked up to 96 with a heavy fastball on Sunday night, and he was able to strike out the side in order with three different pitches in his arsenal. The most impressive of the strikeouts was his final one where he broke out a nasty changeup at 89 mph to get Gunnar Henderson swinging. When it seemed like it was time for the bats to come alive again, Matthew Thompson trotted out to the mound for his inning of work in the top of the sixth. Thompson made hitters look silly all inning with a power curve, and he was able to command the strike zone well during his outing. Many players had family and friends in attendance at Sunday night’s game; however, the player with arguably the biggest fan section was Spencer Jones. Jones was impressive in his inning of work on the mound, striking out two and getting help behind the plate from the big arm of Darius Perry. Jones worked up to 93 with a good fastball, and his command with both pitches was much improved from his outing at the 17u WWBA National Championship last month. After throwing the scoreless top of the eight inning on Sunday night, he was able to get something started in the bottom half of the inning at the plate. The winner of the two-way player of the year award at Saturday’s dinner banquet, Jones laced a leadoff single into center field in front of friends and family that were in attendance. With cheers growing louder in the crowd, Jones was able to use some excellent baserunning to scamper home on a Logan Britt ground ball, extending the West squad lead to 4-2. A bright spot for the East squad came in shortstop Nasim Nunez. Nunez seemed to be all over the field on Sunday night, making incredible plays at shortstop while causing havoc with his speed on the bases. Nunez was able to score the East Squad’s second run of the game on a passed ball as well. Nunez wasn't the only speed demon on display in tonight’s action as there were a total of five stolen bases on what was an impressive lineup of PG All-American catchers. 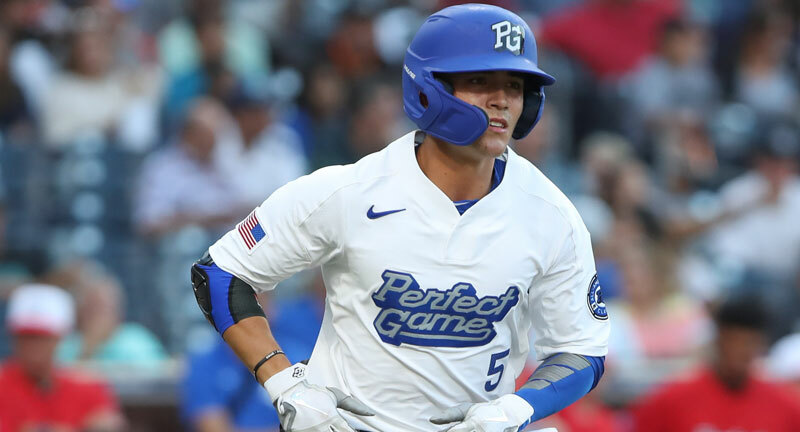 In what has grown into the marquee event of the summer for some of the best high school baseball talent in the country, this year’s Perfect Game All-American Classic again provided a glimpse into the future of baseball at the big league level. This game brought together the best of the best on Sunday night, and you can expect to hear some of these same names called in next year’s MLB Draft. Great ballplayers, great people, and great times highlighted the action all week in San Diego. These moments and performances have defined the Perfect Game All-American Classic in the past and will continue to do so in the future.